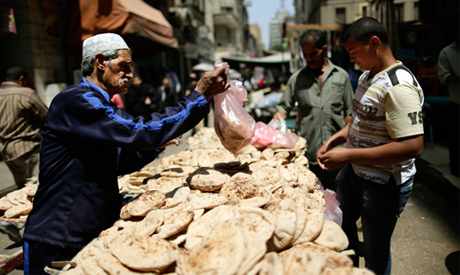 Egypt will increase the amount allocated to individuals holding food subsidy cards from EGP 18 to 21 starting next month, Supply Minister Mohamed Ali El-Sheikh said at a Friday press conference, in a bid to compensate for food price hikes caused by the flotation of the pound and increase in fuel prices. During the conference, Finance Minister Amr El-Garhy said the increase of the individual's share in the smart-card system for buying subsidised food will increase the state budget in this category from EGP 44 billion to EGP 50 billion. Prime Minister Sherif Ismail, also speaking at the conference, said that some product prices will increase after price hikes in oil products. "I will meet with the country’s provincial governors to put a plan in action to control price hikes," he added. "There is a need to revise those who have access to subsidised products to ensure that subsidised food reaches those who deserve it." Also speaking at the conference, Minister of Social Solidarity Ghada Wali said that one million participants in the pension programme Karama and Takafol were added to the subsidy-card system. Karama and Takafol aims to increase the consumption of individuals and families living in poverty. Wali also said that the government had decreased the age of those receiving the programme's benefits from 65 to 60 years. In August, the country announced that the smart-card system for selling subsidised food will soon fall under the authority of the military production ministry instead of the ministries of supply and planning. At the time the decision was attributed to "speed up the issuing of the food subsidy cards, replace lost or damaged cards, raise efficiency and provide machinery for new bakeries and groceries."